New for 2017, the “high output” Street Rod 750 from Harley Davidson. 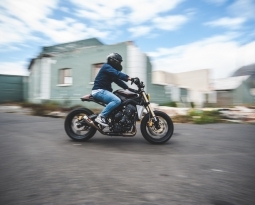 The boys from Milwaulkee claim this version of the original Street 750 is an almost all-new and vastly improved motorcycle.The Street Rod 750 is Harley Davidson’s attempt to enter the middleweight, “naked bike” segment of the South African motorcycle market. We rode the bike for three consecutive days. 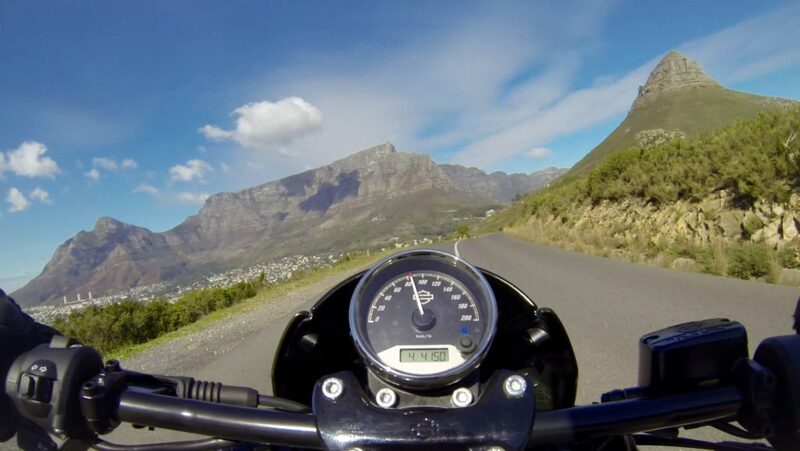 I collected the media test bike from the Cape Town Harley Davidson dealership and almost immediately, all was not well. Two issues became apparent. Firstly, the headlight bulb had blown and secondly, the neutral position inside the gearbox seemed to be non-existent? Both of these issues alerted my skepticism as I had recently read how the manufacturer had put a large emphasis on improved build quality. Perhaps the neutral issue could be resolved with adjustment to the clutch cable and a headlight bulb is considered to be a ‘consumable’ part, one could argue? Giving it the benefit of the doubt, I set off in search of traffic-free roads where I could begin to formulate a clear opinion of this new motorcycle. Close-up of the air intake detail. The styling on this bike is almost completely revised bar the fuel tank which has been moved upwards and further forward. 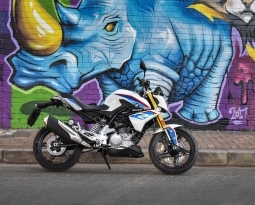 In doing so, the design team have attempted to move away from the laid back, cruiser styling seen on the Street 750. The new bike has a more aggressive stance with a beefy upside down fork and 17 inch front wheel. The straight handlebar pulls you further forward into what could be described as a purposeful riding position. The mid-mount foot pegs have been raised to increase ground clearance and improve cornering lean angles. The foot peg position has been the cause of many online complaints about the awkward rider triangle, suffered mostly by the taller test riders. 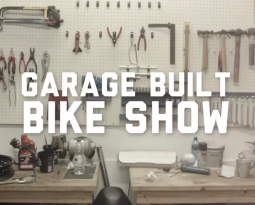 I am fairly short and the bike seemed to fit me perfectly. Whilst on the topic of foot placement, I did have an issue with the position of the 2 into 1 exhaust silencer. Your right foot has no option but to rest on the exhaust preventing any rearward or aft movement. This was not uncomfortable, simply something that I had to get used to. The silencer now features a clever heel guard preventing a melted boot. 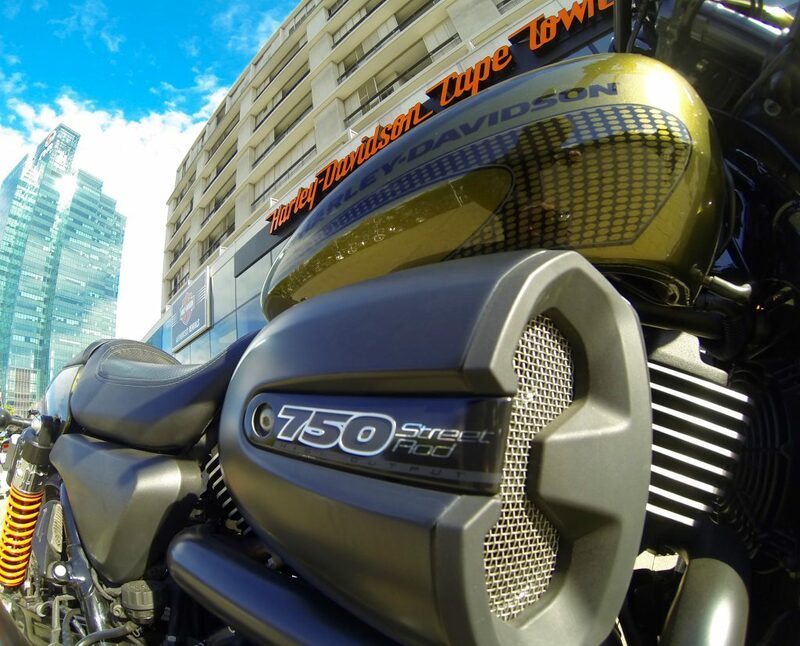 Clear proof that Harley Davidson has listened to the previous criticism of the Street 750 and addressed this, providing a solution to the problem. Other areas of noticeable quality improvement include, cleaner alloy castings, neater wiring and vastly improved mirrors. Personally I am not a fan of the bar-end mirror but they are quality and work effectively. 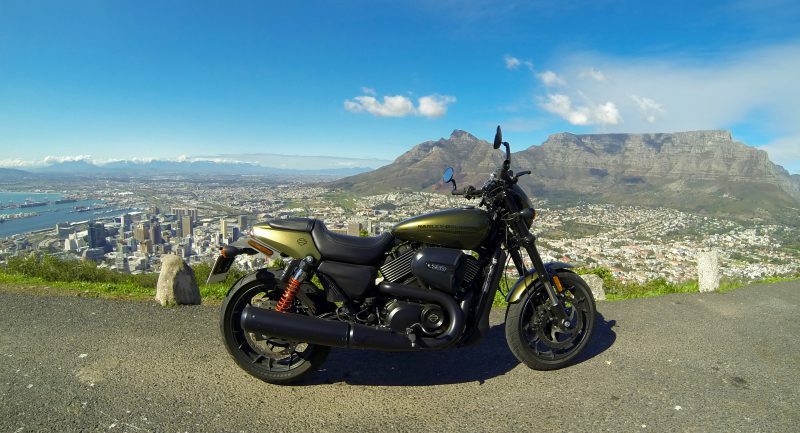 The street Rod 750 parked on Signal Hill overlooking Cape Town. The new Revolution X motor is believed to have 8% more torque and 18% more horse power than the original motor found in the 2015 Street 750. The new mill comes with a redesigned, larger volume air box feeding bigger, dual throat, 42mm throttle bodies. The V-Twin’s compression ratio has been bumped up too. The Street Rod is now a motorcycle that is fast enough to get yourself into trouble and I like that! The handling is light and precise, the bike turns into corners effortlessly due to the decreased rake of the fork and the 17 inch front wheel. The suspension and brakes are fantastically matched to engine output, a five-star effort from the engineering department for achieving this performance balance. 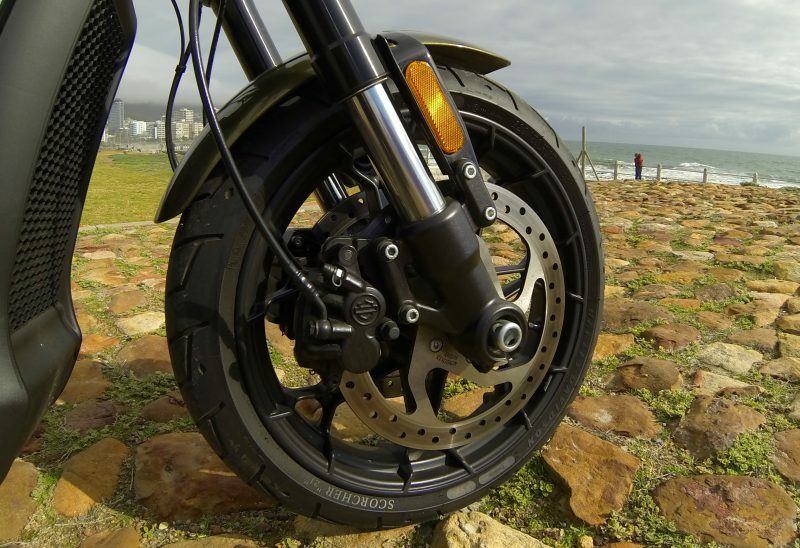 Abs is standard equipment here in South Africa, the dual front discs have braided lines and give a progressive feel but do a good job slowing the bike down. Suspension damping is set slightly on the firm side, which I personally prefer on a bike like this that has the intended ergonomics and performance for spirited riding. 17 inch front wheel and dual front disc. The seat is comfortable and the black perforated leather is a nice touch, further adding to the quality feel of the overall product. The single clock speedo with integrated digital gear position and tacho was easy to read. The inclusion of this technology was welcomed, and again proves that the Motor Company have thoroughly thought this bike through. Towards the end of my second day on the Street Rod 750, I really started to enjoy the bike. The audible intake noise under hard acceleration was great and the burble and popping from the exhaust on the over run is entertaining indeed. I imagine an aftermarket, free-flow silencer would considerably increase the ‘braap’ fun factor. At times, I found myself physically shaking my head in disbelief that I was testing a genuine Harley Davidson product. A feather in the cap for the manufacturer. The SOHC 4-valve motor likes to rev, with a noticeable mid-range bump in power around 6000rpm. The rev limit has been increased from 8000 to 9000rpm and the engine produces a commendable 68.4Hp at 8750rpm. Firstly, I cannot overcome, above all else, is the styling of the Street Rod and in particular, the shape of the fuel tank. 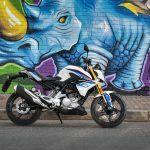 The wide, flat top of the fuel tank and the soft rounded edges look out of place against the newly designed angular shapes that appear throughout the rest of the motorcycle. I wish they had redesigned the proportions of the tank and moved away from the look of the Street 75o completely. For anyone else who may be considering the new Harley Davidson, this is only my subjective opinion based purely on one aspect of the styling. Secondly, and factually speaking now, the Street Rod has entered a well contested segment in the market where Japanese contenders offer comparable machines with better performance figures, bikes that are more lightweight and sold with more attractive pricing. Therefore purchasing the Harley Davidson Street Rod 750, I believe to be a purely emotional decision whereby owning the bar and shield logo is the defining factor for a potential buyer. Harley Davidson is an aspirational brand to many, many people and there is absolutely nothing wrong with that. 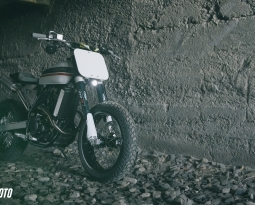 Written by: Kyle Scott for Wolf Moto Motorcycles.